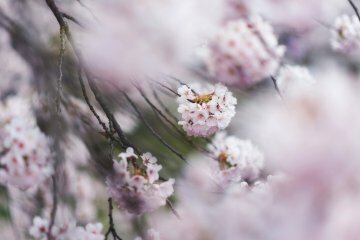 Japan's cherry blossom forecast is out for 2019, with the main sakura bloom expected to start a little earlier this year compared to average. The cherry blossom bloom arrives in Tokyo by March 22nd and Kyoto by March 24th, with full bloom expected in the following weeks. 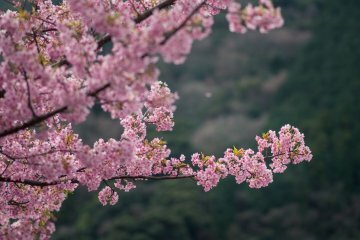 Plan the perfect trip around these sakura dates and experience the arrival of spring in spectacular style! Discover the top cherry blossom spots in Japan, from Hokkaido in the north, to Okinawa in the south. Learn more with our regional cherry blossom guides or take a closer look at the 2019 forecast for each area. Japan's Kanto region is home to Tokyo prefecture, with Ueno Park, Shinjuku Gyoen and Nakameguro famed for their cherry blossom blooms in the Spring, but further afield Kamakura, Hakone and parts of Saitama, Chiba and Ibaraki are worth exploring. Enjoy the best cherry blossom spots in Kansai, with Kyoto looking extra stunning during this time of year, such as the Arashiyama area and its yozakura tradition of evening light-ups and hanami events amid the pink foliage. Nara's Mount Yoshino and Osaka's castle area also promise beautiful cherry blossom foliage to admire. Enjoy the best cherry blossom sights in Tohoku, which sees a later bloom than most of Japan. The castle moat in Aomori's Hirosaki is one highlight, with Fukushima's Hanamiyama, Iwate's Takamatsu Park, and Miyagi's picturesque Hitome Senbon Zakura also worth stopping by. Enjoy the best cherry blossom sights in Chubu, from Ishikawa's Kenroku-en Garden to the Fuji Reien Cemetery in Shizuoka. Hokkaido's cherry blossom blooms later than the rest of Japan, but promises highlights such Goryokaku's surrounding park enveloped in pink blossom (admire from the Goryokaku Tower), or Sapporo's many parks, such as Moerenuma Park, Maruyama Park and Makomanai Park, as well as spots around Asahikawa (Asahikawa Park), Furano and Otaru. Popular hanami hotspots here include the Kintaikyo in Yamaguchi's Iwakuni, Okayama's Korakuen Garden and Tsuyama Castle, Hiroshima's Senkoji Park and Tottori's castle park. Shikoku enjoys some spectacular cherry blossom spots, as the bloom arrives in late March. As well as the view of sakura against the Seto Inland Sea from atop Shiudeyama, Ehime's Matsuyama Park and Kochi's Hyotan Zakura—a 500 year old tree—are considered cherry blossom highlights. The southern island of Kyushu is full of natural beauty, with many stunning cherry blossom spots to be discovered, from Kumamoto's Suizenji Garden to Maizuru Park at Fukuoka's castle ruins. Okinawa seems some of the earliest cherry blossom in Japan, thanks to its location to the far south. The bloom typically starts in mid-January and finishes by the end of January or early February. Cherry blossom festivals can be seen at various hotspots, such as Naha, Nago, Yaese, Nakijin castle ruins and Motobe Yaedake. Unsure where to start your sakura sojourn? Explore from a range of cherry blossom-themed experiences and package tours – provided by Japan Travel Holidays, our trusted tour agency provider. 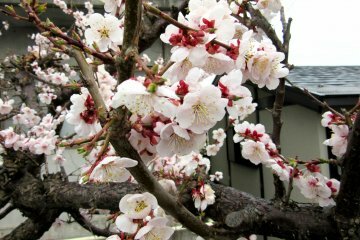 Hanami—literally "flower viewing"—is the Japanese tradition of visiting and admiring the cherry/plum blossom each Spring. Cue a rush to find the best seating position underneath the cherry trees, as half of Japan heads to the parks to go drinking under the trees! 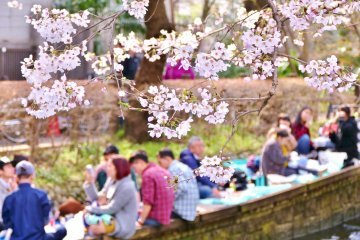 From midday family picnics to evening parties under sakura illuminations, expect Japan to be a little busier during this period. 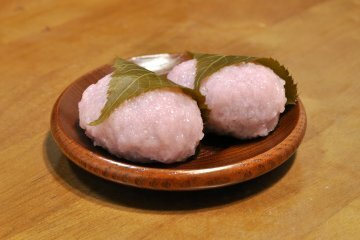 Find out more about hanami with our guide. Find out all you need to know about Japan's cherry blossom, and the top things to do during Spring in Japan. Seeing the full bloom in Japan can be considered one of the best times of year to visit Japan, with beautiful foliage and warmer weather also playing their part. It helps to plan ahead and book as early as possible, as it is considered peak season for travel too.